It was 1929, and Marlene Dietrich was appearing on the Berlin stage when Austrian-American film director Josef von Sternberg first caught sight of her. Something in her attitude intrigued him and he thought she might be right for the female lead in his next film, The Blue Angel, to be Germany's first sound film and produced in both German and English-language versions. 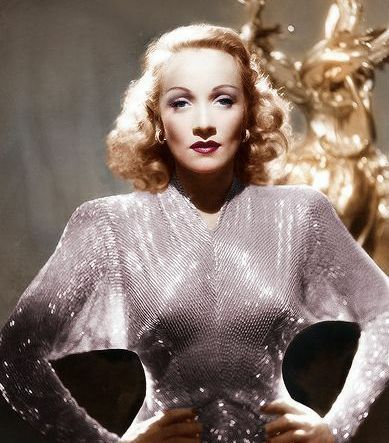 Dietrich would later claim, "My so-called biographers eagerly published a long list of films in which I had appeared at that time and supposedly played leading roles. This is not so. When Josef von Sternberg chose me for The Blue Angel, he was hiring an unknown." She was cast as Lola Lola, a singer/dancer in a tawdry dive called "The Blue Angel," a more wanton and fleshy seductress than those the actress would later portray. Dietrich's transformation from curvy brownette to svelte blonde would become a subject of some conjecture. She credited her changing onscreen appearance (and quite a bit more) to her director. Von Sternberg, she said, had placed the main spotlight very low and far away from her to add prominence to the roundness of her face, "No hollow cheeks for The Blue Angel," she would write. "The secret face with the hollow cheeks," the look she became famous for, "was achieved as a result of placing the main spotlight close to my face and high above it." From von Sternberg, Dietrich learned a tremendous amount about lighting and camera; so much so that her knowledge was often greater than that of directors and cameramen she worked with after their collaboration ended. And, to ensure she was being photographed to her best advantage, she came up with the idea of watching herself while filming by placing a full-length mirror next to the camera. Billy Wilder's A Foreign Affair was the second American film Dietrich made following World War II. The plot centers on a triangle involving a U.S. Army officer (John Lund) in occupied Berlin, an ex-Nazi cabaret singer (Dietrich) and the American Congresswoman (Jean Arthur) who is investigating her. Although second-billed to a very fine Arthur, Dietrich's performance is the showpiece. 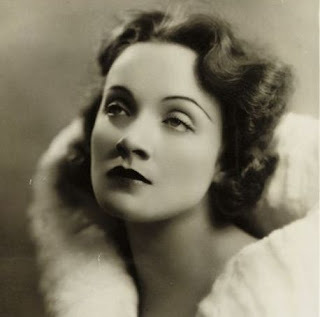 Wrote Bosley Crowther in his review for the New York Times: "...it is really Marlene Dietrich who does the most fascinating job as the German night-club singer and the charmer par excellence. 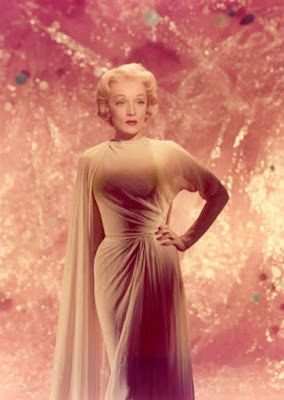 For in Miss Dietrich's restless femininity, in her subtle suggestions of mocking scorn and in her daringly forward singing of "Illusions" and "Black Market," two stinging songs, are centered not only the essence of the picture's romantic allure, but also its vagrant cynicism and its unmistakable point." Mostly dismissed by critics (though a box office success at the time of its release), Alfred Hitchcock's Stage Fright is worth taking the time to sit down and watch, if one accepts that the murder mystery at the film's core is convoluted, that there are almost too many pivotal characters to count and that the opening flashback misleads. Hitchcock biographer Donald Spoto has called Stage Fright a "comic masterpiece," while noting that it is "a film demanding the most careful attention." During one of his interviews with Francois Truffaut, Hitchcock revealed that two things attracted him to Stage Fright: it was a story about the theater and, when the book was published, reviewers mentioned that it could be "a good Hitchcock picture." He admitted to Truffaut, though, that he had problems with Jane Wyman, who was top-billed over Dietrich. Wyman was playing a young actress who, in trying to solve a murder, disguises herself as a ladies maid to Dietrich, an established actress and the prime suspect. Hitchcock said, "...she should have been rather unglamorous; after all, she was supposed to be impersonating an unattractive maid. 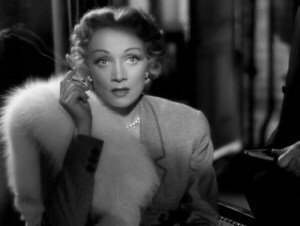 But every time she saw the rushes and how she looked alongside Marlene Dietrich, she would burst into tears. 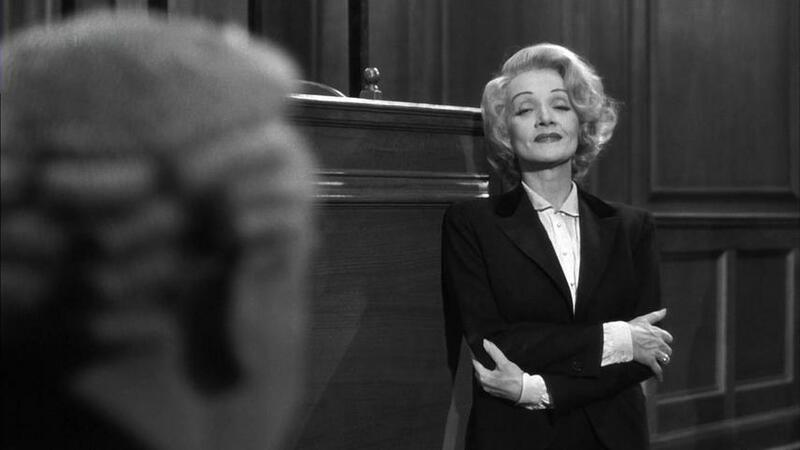 She couldn't accept the idea of her face being in character, so she kept improving her appearance..."
Billy Wilder's Witness for the Prosecution has been described by some as one of the best "Hitchcock films that Hitchcock didn't make." Adapted from Agatha Christie's popular stage play and nominated for six Oscars, it is always at or near the top of lists of the greatest courtroom dramas on film. Boasting an all-star cast - Tyrone Power as an accused murderer, Charles Laughton as his defense attorney and Marlene Dietrich as the wife of the accused - Witness for the Prosecution was one of the most ballyhooed and popular films of 1957. 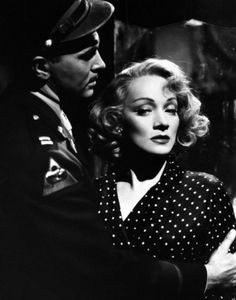 The story is set in London and Dietrich portrays a German-born, one-time actress who met her Allied soldier husband in Germany during WWII and returned to England with him after the war. But Marlene's involvement in Witness for the Prosecution went beyond a role that could be interpreted as a glimpse into what became the future of her character in A Foreign Affair. Dietrich's additional participation required dogged determination and hard work and included some intense dialect coaching courtesy of Charles Laughton. Without giving anything away, it can be said that her efforts paid off to the extent that Wilder warned her, "You'll never get an Oscar for this. People don't like to be made fools of." Whether he was right or wrong, Dietrich did not receive a nomination for her performance in Witness; her sole Oscar nod would be a Best Actress nomination in 1930 for Morocco, the film she credited with making her a star. Marlene Dietrich's film work virtually ended in the early 1960s when she began to focus entirely on the second career she began in the 1950s as a highly paid concert star. Her last credited screen roles were in Touch of Evil for her friend Orson Welles in 1958, Judgment at Nuremburg in 1961 and Just a Gigolo in 1976. Late in her life, she was the subject of two worthwhile documentaries. 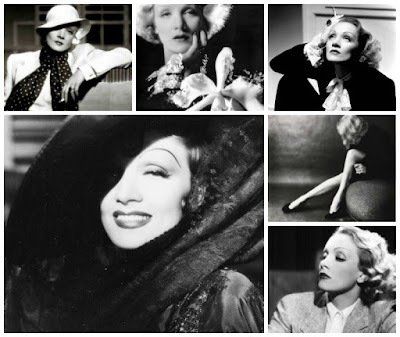 One, Marlene Dietrich: I Wish You Love (1973), featured her concert act and was presented as a television special. The other, Maximilian Schell's extraordinary 1984 biographical documentary, Marlene, featured only Marlene's voice (she insisted her face not be filmed) along with archival footage, stills and commentary. By the time one of her biographers, Charlotte Chandler, met her in Paris in 1977, Dietrich was in the process of "closing the door," that is, disappearing from the public eye, as so many great beauties do once their looks have gone. She would confide to Chandler, "It can be a curse being beautiful, after a certain point, as it slips away, as age steals it." And yet, French actor Sacha Briquet, who knew her in her late years, remembered, "Even bed-ridden she was the most beautiful old lady I'd ever seen. There she was with no makeup but still beautiful skin, big blue eyes and little hands fluttering like small birds in the air. She smelled beautiful, too, like roses." Her life spanned almost all of the 20th century, from 1901 until 1992, and she was a star for more than 60 of those years. Today, her tantalizing legend lingers. This post is one of my contributions to the Summer Under the Stars 2015 blogathon hosted by Journey in Classic Films. 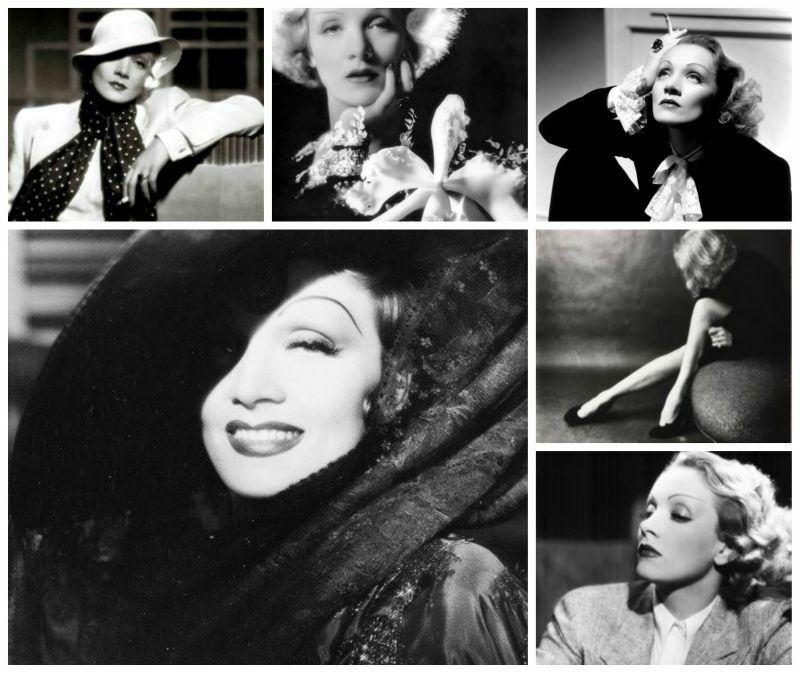 Dietrich is timeless. Thanks for the great article, and also for calling attention to the upcoming TCM showings of "Shanghai Express" and "Stage Fright", which I haven't seen; I expect the prints to be beautiful, as usual - I will definitely watch. I'm especially looking forward to "Shanghai Express" as I appreciate Dietrich's work with Von Sternberg in "The Scarlet Empress" and "The Devil Is A Woman" (over-the-top beautiful). If a director is looking for an actress to be the focus for the theme of obsession, Von Sternberg definitely discovered the right woman. I wonder which came first - was it the theme of obsession, or was it the woman who inspired the theme? Of the "silver screen goddesses" from the '30s and '40s, Dietrich alone stands the test of time. Mr. von Sternberg had much to do with this, since it is the films they made together that established the persona that defined her throughout the rest of her life. He consistently presented her as an archetypal femme fatale, enigmatic and out-of-reach. And she maintained that persona into her 70s, until she disappeared behind the door of her apartment in Paris. Two things that enhanced her timeless appeal: von Sternberg was a visual stylist who cared little about dialogue, and Dietrich's generally low-key approach to acting seems understated in comparison to the overly melodramatic style popular then and employed by most leading ladies of the time. From what I can tell, von Sternberg was an obsessive and it would seem encountering Dietrich inspired him to explore the theme of obsession - as well as his own obsessions. I don't get how all else is dated please do elaborate... Frankly its like Rita Hayworth, Ginger and Mae West did pretty good timeless too. A very insightful and penetrating look at la Marlene, some of her great films, and her enduring image. Such is the power of Hollywood in the hands of masters like von Sternberg and sirens like Dietrich. Yet she worked as hard as anybody, rivaling Crawford in her obsessive attention to her dress and image. 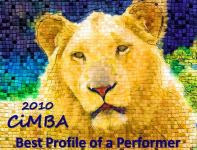 For all the megatronic attention paid to certain stars today, where is her like? Thanks for covering Marlene and her coming films Lady Eve. 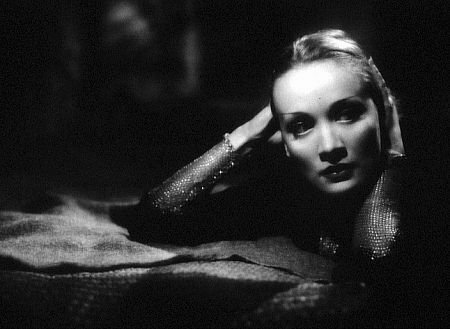 Marlene was famous for her work ethic and the care she took to maintain the Dietrich image. I have to wonder if she understood that the legendary persona she (and, at the beginning, von Sternberg) created would live on as it has. I'm sure she hoped for it. What did you think about the inclusion of Manpower in the Summer Under The Stars marathon? It's one of the more "off-the-beaten-path" Dietrich movies, I'd say! She has a friendly rapport with the other women in that clip joint, which is not common in most of her other films, and she's totally immersed in a '40s blue collar environment. Dietrich is always in her element as a nightclub (or clip joint) performer but she is so much too gorgeous/glamorous/sophisticated for Manpower's blue collar scenario (all that mud!) that she seems like a creature from another planet. I do like her scenes with Eve Arden and Joyce Compton (both always so good in supporting roles) and you're right, it's rare that she has gal pals in her films. I enjoyed seeing Dietrich featured during "Summer Under the Stars". I had not seen "The Blue Angel" in years and I was delighted to find it as moving as I remembered. I think "Stage Fright" is underrated and it's definitely a film that merits being seen more than once. It's very entertaining and surprisingly light in tone, a factor that may throw off some Hitchcock fans. I always enjoy Jane Wyman's performances (she had great range and very effective screen presence) so it's a shame that she felt so intimidated by Dietrich that she let it affect her portrayal. Then again, who can blame her? Hitchcock had a fondness for glamorous female movie stars (he always lamented that he never had the chance to work with Norma Shearer) and "Stage Fright" provides a fine showcase for Dietrich's silky glamour. Thank you for your comment. Obviously, I agree that this film deserves more attention and respect than it generally gets. Though it has its very dark moments, it is lighter than one might expect of a film titled "Stage Fright." One complaint frequently lodged against the film is its misleading opening flashback. I don't believe that a film-making rule exists that requires a murder suspect to be truthful when retelling, through flashback, his version of events. I don't think it should surprise any fan of Hitchcock, who loved to toy with the viewer, that he might do such a thing. Von Sternberg was the perfect film director for Dietrich's allure. He was a visually stunning filmmaker and she was his perfect muse. She was fortunate enough to work with other great filmmakers too like Wilder, Lang and Welles and they were fortunate enough to work with her. I agree completely, Dietrich and von Sternberg were a perfect match. She did work under a lengthy list of formidable directors - I featured Hitchcock and Wilder here and you also mentioned Lang and Welles. She also starred in a lesser known Ernst Lubitsch film titled "Angel" (1937), which I haven't seen yet.